“Oh, and it cures world hunger.” This was a sarcastic taunt from my middle son as we were reviewing the medicinal benefits of Rosmarinus officinalis. I cut a bunch of rosemary from my front porch garden to flavor a tray of roasting winter vegetables. Calvin, on the other hand, had another idea. He immediately called for the mortar and pestle and began breaking down the leaves before dowsing them with boiling water. He created a big pot of rosemary tea and had he not done so, I would’ve never discovered that he didn’t invent the idea. Rosemary or rosmarinus officinalis is a popular culinary herb in my kitchen. I love the piney aroma and the fact that it grows as an abundant evergreen with minimal attention. In fact, it is so easy that I often spy it at a hedge amongst office buildings and parking lots in our city. What I did not know was exactly how useful this herb can be. 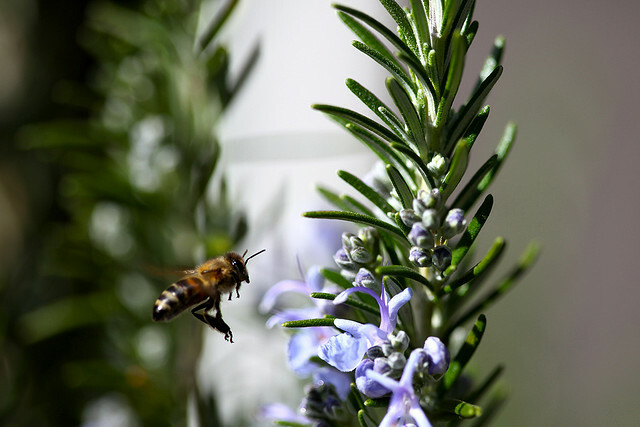 Scientists from the Cancer Research Institute of Slovak Academy of Sciences and the Faculty of Medicine, University of Catania, Italy have found that rosemary extract can significantly help to protect DNA against free radical damage. According to them, rosemary extract helps protect skin cells, preventing age-related skin damage such as wrinkles. State University of New Jersey, found that a 2% concentration of rosemary extract given for 3 weeks was able to significantly inactivate excess oestrogen. This is great news from women like me who take Tamoxifen to block the effects of oestrogen and reduce our risk of recurring breast cancer. French scientists from the National Institute of Agronomic Research in Dijon, found that rosemary extract encouraged enzymes to flush harmful toxins from the liver. According to Germany’s “Commission E,” an agency equivalent to the U.S. Department of Agriculture that deals only with herbs, rosemary is an approved remedy for treating symptoms of digestive distress. Dr M Halaoui from the University of Fez in Morocco studied the effects of rosemary extract’s diuretic actions on the kidneys and found that a daily dose in liquid form can improve kidney function significantly. My research and Calvin’s experiment uncovers that one of the best ways to benefit from the excellent properties of rosemary is by drinking it as a tea. It contains powerful antioxidants and many vitamins. Rosemary leaves are high Vitamin A, B1, B2, B3, B6, B12, biotin, pantothenic acid, Vitamin C, Vitamin D, Vitamin E and Vitamin K. Whew! Apparently, you can also gargle with it for it’s antiseptic properties or add the tea to your bath water to assist with poor circulation or skin irritations. We uncover more not nearly so well-documented benefits from increasing brain function to preventing cancer. And of course, there is the fine print; consult your physician before ingesting rosemary tea if you are pregnant or suffer from high blood pressure, hypertension, insomnia, or epilepsy. Turn your kids loose in the kitchen and see what they might discover! Best yet, turn yourself loose and enjoy a cup of rosemary tea – today’s cure for world hunger. Steep for 10 minutes. Then, strain and sip and enjoy the many benefits. powerful The ancient Greeks used Rosemary for many medicinals including memory. Mixed with garlic it is absolutely delicious with lamb. An amazing plant to be sure. Just smelling it makes me smile. Thanks for reminding us and kudos to Calvin. You are the expert in all things herbal Sally! I found this interesting and informative, thanks so much for sharing. I think I remember reading that it also grows quite abundantly in South Africa? This is great info. I love cooking with rosemary for the flavor, but I had no idea it has so many wonderful additional benefits and uses. Thank you! Yes, keep cooking with it. It’s doing some great things there in the background. I love rosemary! It’s always been one of my favorite herbs, and now I have even more reasons to use it. Thanks for the great information! You are welcome. Nice to see you here Kami. Thanks for the great information. I hesitate to use my rosemary when it is in bloom. Does anyone know if this affects the flavor at all? I would remove the flowers, of course. All I know is that fresh herbs should be most flavorful when cut in the morning, before the sun is on them. Thank you for any help! I know that Sally Mom knows the answer to this. We’ll get back. Often, plants will have a different flavor when they are flowering and going to seed. Although perfectly fine to eat when flowering, the flavor may be altered a bit, usually more bitter. You may find you enjoy it! Another fun way to use herb flowers is to fill an ice cube tray (remember those?) half full with water, place flowers of your favorite herb on top and freeze. When frozen, fill until full and refreeze. Use these beautiful ice cubes for a lovely addition to your beverage. That is a great idea Lisa! LOVE rosemary! I have fresh pots of assorted herbs, including rosemary, on my kitchen window sill. I didn’t know all the medical benefits of it (tho, I am not surprised). Herbs, in general, are simply amazing and I try to use them as often as I can. I did start to talk about my shampoo but decided that the audience of interest might be limited! Edible Rosemary flowers? Yes, absolutely. Nice in seafood or chicken salads, even sprinkled in green salads and mixed in melted butter with garlic for an artichoke dip. Always remember with any flower, that it has not come to you with pesticides. Do not forget to use the tougher woody stems as skewers for shrimp, scallops, chicken and lamb. Wonderful for vegetables as well. Very cool! I used to be a black-tea-is-the-only-real-tea person, but I’ve had to branch out to cut back on my caffeine intake. This sounds interesting. I’m excited to give it a try. Thanks for a great reminder about rosemary. I had forgotten (if I ever knew) its great benefit to kidneys…and that is useful info for me. Kudos to Calvin! It seems to be good for almost everything Barbara. Thanks Tammy I love rosemary bread. I will give the tea a try. Oh I do too Sammy. Especially focaccio. Sounds like a lovely tea for after a big dinner! I could use some right now. In fact, think I will. I love rosemary: the smell of it, its beautiful blue flowers, and its astringent taste. It is exotic. I have never drunk it as a tea. Must try it…thanks Tammy…. Astringent taste is a great description Kate. How cool is that! Sounds like you’ve raised him right, Tammy. So far Todd! he’s 11 and I’m praying for the best. We love rosemary-garlic foccacia and roasted veggies and potatoes with rosemary. One of favorite herbs. Yes, roasted veggies is what started it all – I’m amazed at how many people enjoy it. So glad you liked it. I’ve been sipping it all week too. I adore rosemary, so am delighted to hear it’s so good for me 😉 There’s a rosemary bush at my parents’ place that is always threatening to take over the garden, so I’ve grown up eating it in lots of dishes. Have never made tea with it though – great idea! And good for holiday gifts too! Mmmm! Rosemary tea sounds lovely. Jim Duke has rosemary in the Alzheimers section of his garden, saying that it has been shown to aid systems that support cognitive functioning. I found this especially interesting given rosemary’s folk reputation of aiding memory (“rosemary for remembrance”). Wow. I’ve never heard that “rosemary for remembrance”. But yes, I did find an Alzheimers study as well touting the benefits. Really, it doesn’t seem like there is anything it can’t do. Great to hear my favorite herb is a multitasker I love to put it over coals to roast and smoke beets, onions, and other roots. Yes, someone mentioned that to me today. I hadn’t thought of putting it right on the coals. I LOOOOVE Rosemary! It’s my favorite herb! I also love that it grows like a weed all around where I live….it’s literally everywhere! We have a lot also and I think we need to convince others of its value. Yeah and I’m sitting here sipping a cuppa at quarter to ten. Hmmm maybe a problem. The oil I’m wearing contains geranium, rosemary, vetiver and lavender. It may sound like a strange combination but it is very subtle and smells divine. I don’t know vetiver but the rest sounds lovely. I love the lavender-rosemary combination. I love the smell of rosemary. It’s also one of the more photogenic herbs. Interesting info about rosemary. This is very interesting, Tammy. Thank you. I also love some rosemary leaves grilled with vegetables. Or in tomato sauces. Or on pasta. As a tea, I heard it helped lessening allergies at this time of the year. Yes, it seems to do so much. Just went through the garden checklist. Rosemary sounds like a great herb to start off with. On a fun note, we just ate the first pomegranate from our indoor dwarf tree! Very scrumptious. Good for you! I have a couple of those dwarf trees that are producing. You have such an awesome blog I gave you the Stylish Blogger Award. i had no idea about this at all! thank you for such an informative post! You’re welcome Kalli. Thanks for reading. Ahhh! I love Rosemary! Its so funny, I can grow veggies,fruits, herbs and all number of weeds,but I keep messing things up with my Rosemary! I think Im just gonna plant it and forget it! I love to nibble a little rosemary when I’m working in the garden, contemplating its healing energy and memory-boosting powers. Now, I can add a few more powers to my contemplation. In New Hampshire, I lose my rosemary every winter unless I pot it up and successfully overwinter it inside the house (which is hard). This year, I was successful; I kept two large plants in an unheated room for the entire winter. They’ll be beautiful and huge in the garden this spring. What a good gardener you are to transplant them each year! Rosemary is one of my favorite herbs. Yet I can’t seem to grow it. I kill it every time. I have the same trouble with lavender. I may have to give it a try again this year and see if my luck has changed. It likes the heat – that is for sure. Maybe start it in May? I adore rosemary and now will positively try the rosemary “tea”. Sounds lovely. My favorite new rosemary dish though is far from health conscious—rosemary lemon olive oil cake. It’s crazy good. Thank you for sharing the many health benefits of rosemary. Please post a recipe for that cake!! Here’s a tip if you haven’t tried it: use a mortar and pestle to grind up some rosemary and sea salt, then mix it into some sweet cream butter. Spread a generous amount across a slice of warm sourdough. Delish! That sounds amazing. Will do it this weekend! Mmm, rosemary tea sounds delicious! I will have to try some this week. I have been drinking it ever since I posted. Thanks for another informative post, Tammy. I know! I want to try that cake too! Amazing that such a healthy herb stimulates seizures in any people who are susceptible to them – like epileptics. In our senior’s residence, rosemary is not used in cooking for this reason. I love creams made with rosemary and smear them on liberally when I’m not going to be around vulnerable people. Yes, that’s why I put the fine print warning. It seems there are a few things that rosemary can accelerate and epilepsy is one of those things. Mmmmm, I love rosemary! Never thought of making tea, so I’ll give that a try! Since only the leaves are used, save the long branches to use as skewers. We’ve barbecued shrimp on them, but you could put veggies and meat on them as well. The tea is great and the stems make great skewers. Glad to hear the rosemary I love so well is also so good for me. I just wish mine would grow flowers like that here in Wisconsin! Eleanor from New Hampshire says that she transplants hers annually and had success this year. I love rosemary, and this post is brilliant, I learned so many great facts and tips. I just wish I could grow it in my apartment. I have not had much luck lately and it depresses me when I managed to knock off the last one as I think they are generally very hearty. I have no idea what I did. Check this out and see if it is helpful at all. I’ve been asked by so many people to do a series on houseplants but rosemary was not intended to be one of them.